When people think of shelves, perhaps kitchens and bathrooms come to mind. Or a ledge on which to temporarily place something in the course of your daily routine. Instead, consider using shelves as decorative areas to help add interest and pizzazz. From metal to colors to shelf length, here are some tips for how to incorporate shelves into your existing décor. 1. Consider nontraditional elements such as metal shelves, especially if you are seeking a modern and minimal look and feel. 2. Mix and match. Blending shelves of different lengths and even colors can add interest. 3. Add elements such as framed photography, greenery and accents. Shelves don’t just have to be for books. 4. Consider built-in shelves. While an excessive amount of built-ins can be a turnoff, thoughtful and creative placement can be both purposeful and impactful. 5. Consider black or white shelving, depending on your wall color. The contrast can act as an interesting design element. 6. Incorporate shelves in entertainment areas such as dining and living rooms where they can display treasured mementos, family photos or memorabilia. 7. 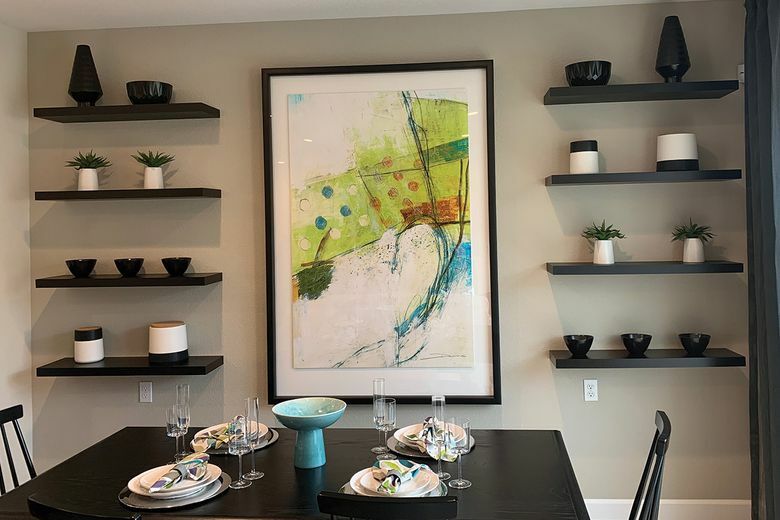 Consider using shelves on long walls as an alternative to traditional artwork. 8. Mix shelves with artwork. Often artwork can help to create a sense of balance. 9. Consider placing shelves in a room that may need extra surfaces such as a child’s bedroom or a crafting space. 10. Place shelves in a useful area such as near an entry or mudroom.